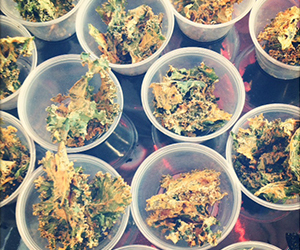 Thank you to everyone who attended our Whole Foods Market demo on healthy snacks! As promised, below are your recipes! Put a dollop on some seasonal fruit or use as a topping for oatmeal. Satisfies late night cravings for ice cream and sweets. Soak cashews in enough water to cover for a couple of hours. Drain. Preheat the oven to 275°F. Wash, stem and thoroughly dry kale, tearing it into large pieces. Set aside. In a blender, purée soaked cashews, soymilk, peppers, nutritional yeast, garlic, onion granules, lemon juice and salt. Line 2 baking sheets with parchment paper. In a large bowl, lightly coat kale leaves with cashew sauce and spread in a single layer on prepared baking sheets. Make sure leaves are not stacked on top of each other, so that leaves dry and bake evenly. Bake 40 to 45 minutes or until crisp, gently turning over about halfway through cooking. You can also use a dehydrator to dry the chips. Remove from baking sheets and repeat with remaining kale leaves and cashew mixture. Cool completely, then store in an airtight container.